We are fortunate enough to live 65 miles from Walt Disney World and even splurged this year for premium passes (entry to all 4 parks with no blackouts, both water parks, golf, Disney Quest and much more). We find ourselves on Disney property at least once a month, even more during the "cooler" Florida season. 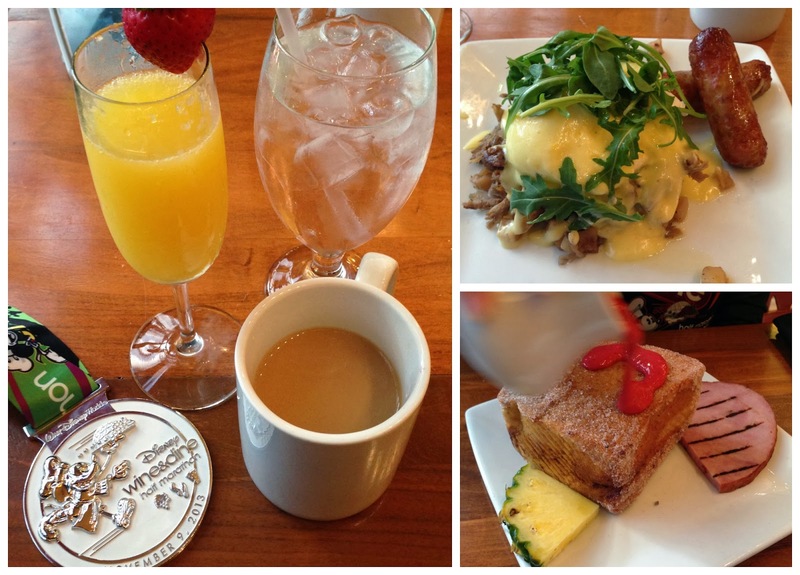 During the Wine and Dine Half Marathon, we stayed on property for 4 days and got to experience Disney like everyone else who was on vacation vs. coming over on a day trip! November happens to be my favorite month out of the year at Disney World. If you time it out perfectly, you can experience Epcot Food and Wine Festival and experience Christmas season at Disney! Food and Wine goes through the second weekend of November. The Osborne Family Spectacle of Dancing Lights starts the second Friday of November, as does Mickey's Very Merry Christmas Party so the parks and resorts are decorated for Christmas and Cinderellas Castle is lit up for the season. You can enjoy the final days of Food and Wine while getting to enjoy the holiday's throughout the parks. I arrived at the hotel on Thursday night, just prior to the runDisney Wine and Dine Half Marathon meetup. 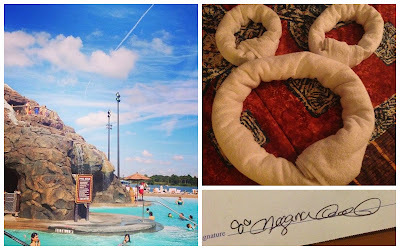 The smallest things excite me - like signing my name next to mouse ears vs. signing at the X. 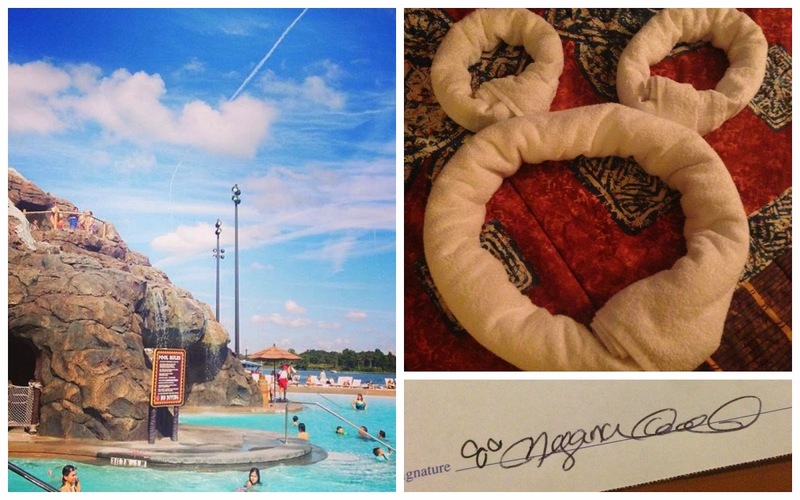 Mouse ears towels and an incredible pool that will turn any adult into a child, no pixie dust required. 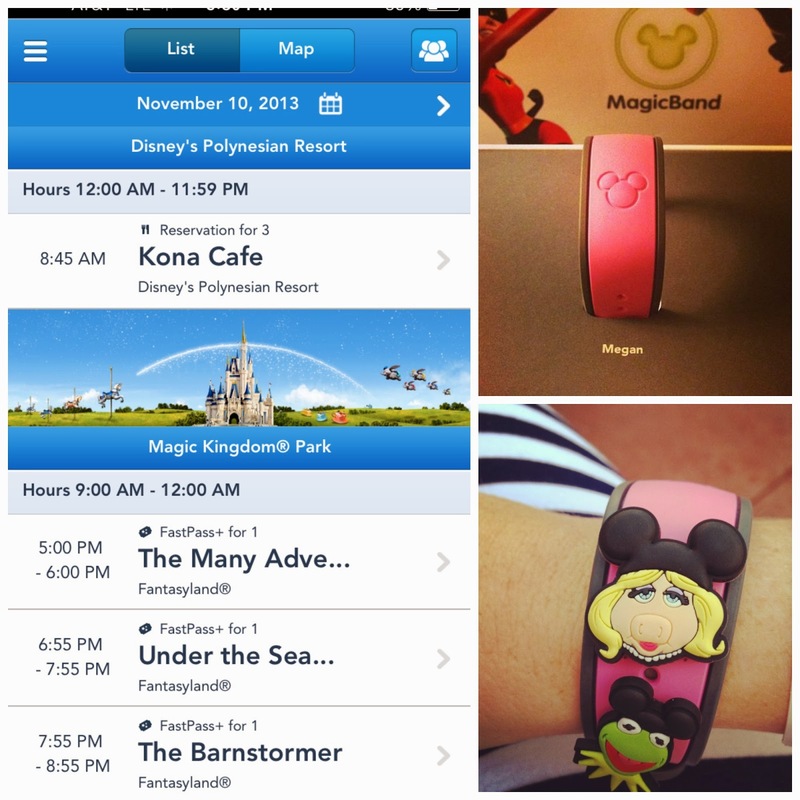 Yet that wasn't what had me most excited - it was this little pink bracelet.....also known as the Magic Band. A bracelet which is your Disney resort key, your annual pass or daily tickets, fast passes, photo passport and even credit card for purchasing items on property (no worries if you lose it, you have a pin number for all purchases). This thing is literally magic and I took full advantage of it on Sunday with fast passes when our niece and nephew visited...No worries of having to run all over property to obtain fast passes for the kiddos - you can do it all online through My Magic . I also blinged mine out with Piggy and Kermie bandits. Bandits are ways to personalize your band to express who you are - check out my friend Meghann's Magic Band experience! Who thought a pink bracelet would make me so happy! After having a great time Thursday night at the meetup with old friends and making new friends, I woke up bright and early Friday, knowing I had a BIG day ahead of me. Two of my best friends (and bridesmaids), Darlynn and Keri were coming to spend the day with me. Darlynn got to the resort super early, so we could witness the daily opening of Magic Kingdom - where guests are welcomed with a train full of Disney characters. This takes place 12 minutes prior to park opening and a randomly selected honoree family along with Mickey, Minnie & friends opens the park with a burst of confetti and Pixie Dust. I can honestly state, I have not seen Darlynn squeal with that level of excitement in a very long time. The magic of Disney officially got to her. I loved strolling through the park checking out the Christmas decorations. I was having a pang of jealousy that we weren't attending Mickey's Very Merry Christmas Party that night. Since we started at the park bright and early, Dar and I literally rode every ride on our list and were done before 10:30. 1 1/2 hours in the park and we had our Magic Kingdom checklist completed. 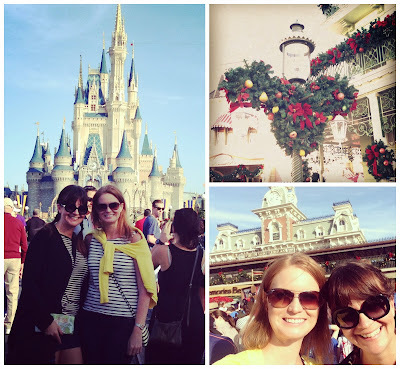 So we headed back to the resort to meet Keri and head off to Epcot Food and Wine Festival. This was my THIRD trip to the Epcot Food and Wine Festival in 2013 so I felt like a living event guide. I showed the girls all of my favorites and loved watching them experience my favorite Disney event of the year. We drank our fair share of wine and champagne, ate a ton of food and had a grand time. I do have a new favorite at Epcot which will be a tradition - in France, with a glass of Moet Rose and Les Halles macarons. You can have the chocolate as this is my version of Heaven! The day quickly passed by and it was time for Darlynn to say goodbye. Keri and I jumped back on the monorail so we could head back to the resort and change. I was truly getting spoiled with monorail transportation. We then headed off to Hollywood Studios so I could show Keri the Osborne Family Spectacle of Dancing Lights - this was the first night of the light display and it was magical as ever. It even snowed on us. You can check out my Osborne Lights recap from last year, including a video of the dancing lights by clicking here. After a very long and exhausting day, it was time to head back to the resort. I needed to get a decent amount of sleep as the following night was the runDisney Wine and Dine Half Marathon. We started off Saturday morning by attending the runDisney expo, then to Animal Kingdom for lunch. I was in a major state of food confusion and couldn't think of anything to eat - so we ended up at Rainforest Cafe, where Gabe had one of the best burgers we've ever had. I didn't get a photo of it :( Meanwhile, I ordered coconut shrimp which were pretty good but I had some major food jealousy. Normally Coconut Shrimp is not something I would eat prior to running a half marathon. I am still questioning why I ordered this. We took Keri into Animal Kingdom since she had never been there. 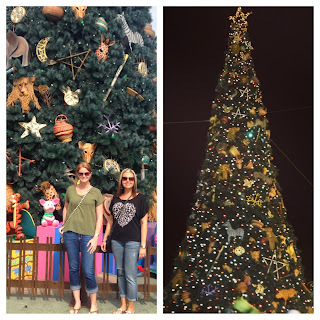 She was instantly gravitated to the giant Christmas tree outside of the park. Gabe and I finally got a decent photo in front of Everest. I swear, every time we have tried to get this photo, it has either been raining, super cloudy or the photo didn't come out well. The next morning, Gabe and I met Meghann for breakfast at Kona Cafe, my favorite breakfast spot in all of Disney World. We properly hydrated with three beverages, I ordered the Somoan (poached eggs over pulled pork hash) and Meghann ordered the famous stuffed Tonga Toast (without bananas). And of course Mimosa's! We decided to continue the Mimosa party after breakfast while icing our sore legs. Meghann ran a Full Iron Man one week prior to Wine and Dine and I was still hurting pretty bad from the NYC Marathon 6 days prior. After we were properly hydrated and iced, Meghann headed to the Magic Kingdom. Gabe and I waited for his parents to come over along with his sister, brother in-law and our niece and nephew. I proudly showed Hailey and Evan (3 & 2 years old) my Wine and Dine medal, both of whom were very excited! Even kept holding it saying "MICKEY!!!". While at the park, thanks to a suggestion from a friend on Instagram named Pamela (who ironically happens to be my cousin's cousin from the other side - smallllllll world) we tried the Chicken and Waffles at Sleepy Hollow Inn at the Magic Kingdom. A sweet and spicy fried chicken breast with slaw and arugula on top of a fluffy waffle. I WAS IN HEAVEN. I am going out on a limb here and say - this was best thing I have ever ate at Disney. At nightfall, I hit a wall of exhaustion like I've never felt before and had to leave the park and go back to the hotel. Before I collapsed we left Disney, I insisted upon getting an updated photo of the Magic Kingdom lit up for the holiday's. While the castle may look stunning in the photo, it does not do justice. Cinderellas castle is so amazing this time of year. I was so sad to leave but had a truly magical extended weekend at Disney. I cannot wait to go back! Do you have a favorite time of year to visit theme parks? If so, when and why? WOW, what an amazing trip! Love the wristband idea...very cool! You guys did SO much in just a few days. That wristband thing is pretty darn cool. I must say, I was surprised to see that you ordered shrimp of all things! However....that fried chicken and waffle dish you had later in the weekend looked sooo amazing. Looks like you had a blast with Darlynn, Keri, and Gabe!